Shiroa��s, the pan-Asian restaurant nestled in an airy and light filled corner of UB City Mall, has always been a personal favourite of mine. I consider the restaurant the Grande Dame of pan-Asian fine dining, as it was a pioneer of sorts in the a�?only dim suma�� lunches that has now become a rage in our city. So, in the Chinese year of the horse, they have introduced Steaming Sensations or quick dim sum bites, coupled with a choice of traditional Chinese teas. 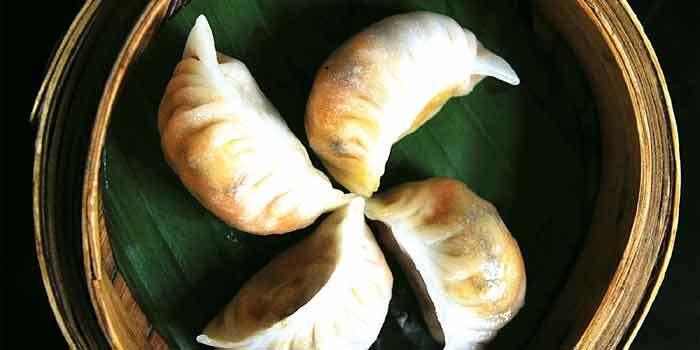 One can pick from an array of over 13 varieties of dim sums, both from the vegetarian and non-vegetarian selections. 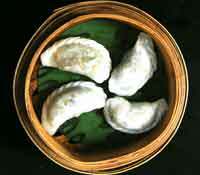 Traditionally, any bite-sized snack is referred to as a dim sum, and does not necessarily have to be encased in a gelatin skin. So, it was really a pleasant surprise when the basket of aromatic Fish in Banana leaf was flamboyantly opened. The aroma of galangal ginger and lemon grass blew us away. I thoroughly enjoyed the steamed chicken and glutinous rice wrapped in lotus leaf too. And the succulent assortment of mushrooms in the rice complemented the dish perfectly. The steamed fish in ginger lemon sauce was also a hot favourite. Amongst the dumplings, the five-spiced chicken with water chestnuts was a clear winner. The steamed prawn roll with Thai herbs and the Phoenix Eye Dumpling (translucent delicate prawns wrapped in an equally translucent wrapper and flavoured with chilly and fish sauce) came in a close second. The vegetarian dumplings were all soft, delicately flavoured and perfectly pleated. The steamed vegetable crystal dumplings filled with chopped shiitake mushrooms, zucchini and Chinese cabbage were delicious as were the Hoisin infused tofu, carrots and shiitake dumplings. But the gently flavoured sweet corn kernel dumpling won our hearts all round. The strong robust jasmine Mandarin tea was my clear favourite as a hot beverage accompaniment, though my companion was partial to the milder flavoured Green Long Ding tea.